'Loire' is one of four individual holiday cottages in L'Enclos. 'Loire' is our two bedroom villa in the prime location next to the pool! Loire can accommodate 4 people. The center of the house is the fully equipped kitchen (with dishwasher and washing machine) open to the living / dining room. The twin bedroom opens off the living area and has French windows opening onto the pool terrace. The double bedroom is on the other side of the living room, with access to the shower room. The shower room is fully tiled and has a large shower function "Italian" - making it convenient for all customers using the house, but especially for anyone with movement difficulties. 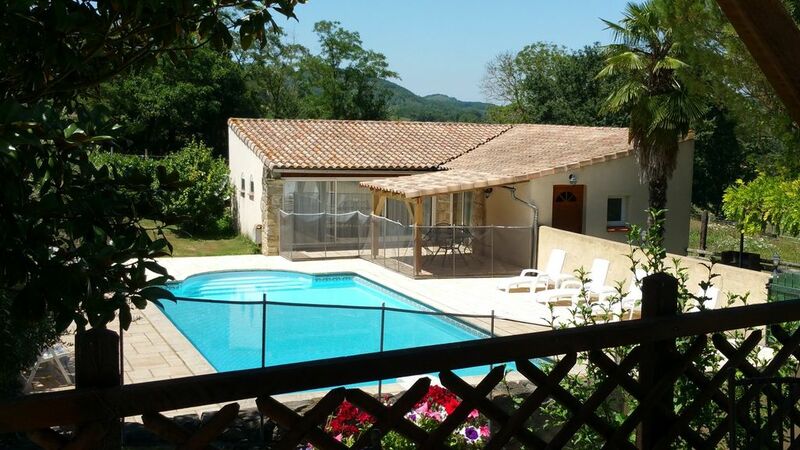 Outside, Loire has a private terrace on the side of the pool and garden area immediately outside the cottage with private barbecue and beautiful views of the surrounding countryside. Loire has electric heating and is suitable for use throughout the year. Our four cottages are two with two bedrooms, one with three bedrooms and one with four bedrooms. The cottages are arranged with our house in two hectares of foothills of the Pyrenees, bordered by a lovely stream, and our 10x5 pool. The homes also have access table tennis, table football, petanque, wi-fi, etc.